Angus McGregor Movies: Movie Sports Team! 2016 is one of the years lucky enough to be filled completely with sport. As well as the usual yearly competitions, this summer will have tournaments such as the Olympics and the ongoing Copa America and European Championships to name a few. As a huge football (soccer) fan- and after getting caught up in the fever of the Euros despite Scotland not qualifying- I thought that it would be good fun to combine two of my favourite things, football and movies. So this post will consist of me choosing 11 movie characters to fill the 11 positions in a football (soccer) team for just a bit of fun. So here's the lucky bunch that made the cut to my team! Now for those who aren't too familiar with football, a football team is made up of 11 players. There are many different formations in the sport so I'm just going to stick with the basic 4-4-2 which includes a goalkeeper, four defenders, four midfielders and two forwards. I will go over each position briefly when talking about the decisions to make sure it is clear why these characters are selected. In no way is this meant to be entirely realistic as obviously characters from sports like hockey wouldn't be adequate. I will also be looking to have only one from a certain movie because otherwise, I would just pick all of those who've appeared in the few actual football movies. It's all just a bit of fun really. Possibly the hardest position on the pitch, the goalkeeper cannot afford to make any mistakes or they will suffer conceding a goal. The position transcends into a number of team sports which involve a goal and is very integral to football and hockey teams. Due to this, it only makes sense to look at movies that have these two sports. A couple of names stand out to me and one of them is Jason Statham's character 'Monk' in 2001's 'Mean Machine'. For one, he actually plays the position that I'm looking for. Unfortunately, the Monk was psychotic. In the Prisoners v Guards match, he couldn't resist causing injury and taking the ball out himself making him unreliable, so I had to look elsewhere. One of my favourite movies growing up as a kid was the Ice Hockey kids movie 'The Mighty Ducks'. One of the most memorable characters in the film was in fact 'Goldberg' played by Shaun Weiss. After a shaky start, Goldberg flourished into a great goalkeeper in the series. When I first thought of this, I thought this would be the certainty for my team. But then I remembered. In the next two 'Mighty Ducks' movies, Goldberg took a seat on the bench for most of it. Julie 'The Cat' Gaffney soon became 'The Ducks' new keeper and proved to be a better player than Goldberg. I can't ignore that which pips 'The Cat' in front of Goldberg to become the first member of my team. Next up is possibly the least glamorous position in football, the full back. Deemed as failed wingers or failed centre halves, full backs most definitely do not get the credit they deserve. So maybe this allows picking players for this position makes it easier as we can look to those who are fairly underrated in their roles. One of my favourite sports comedies is 'Dodgeball' which features many great characters. Vince Vaughns 'Peter La Fleur' is the lead but the underrated member of the 'Average Joes' team is the rage machine Gordon. Gordon does a great job for his team, even saving their skin at times which is vital for a defender. He's reliable and not afraid to get stuck in which makes him a perfect fit for the team. Now with one full back decided, that leaves us to decide on a second player on the other side. Sometimes in defence you just need to get the ball as far away from your goal to avoid possibly conceding. Also just to be able to do the basics with nothing entirely flashy can help as you don't want to be caught out in this position. A lot of candidates for this include many kickers in sports movies such as Nigel Gruff from 'The Replacements'. A native Brit who even was a footballer can kick the ball the entire length of the pitch with a great ping on him. However, Gruff has a gambling addiction that even led him to try to throw a game. Now in a team sport you cannot have a selfish player in that way who may intentionally cost the team a game. Gruff looked to be perfect but his drug and gambling problems makes him unreliable. Fortunately though, he is not the only kicker with experience of playing the game. 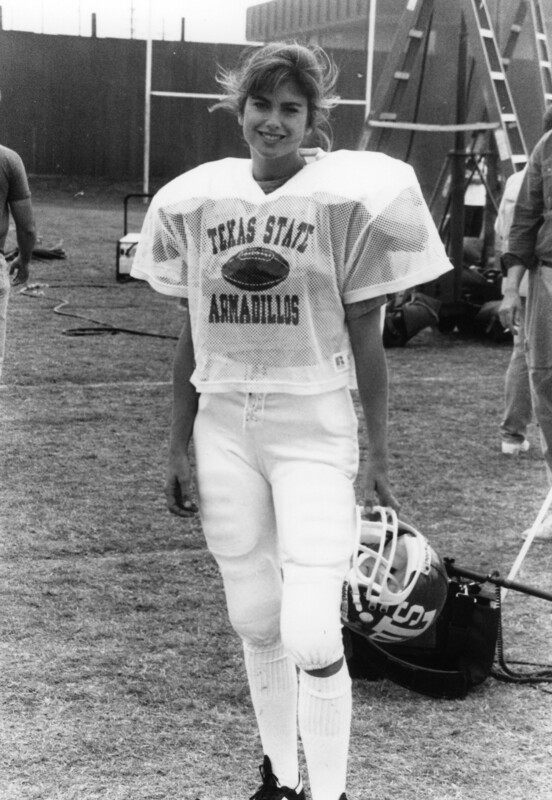 Lucy Draper played by Kathy Ireland in 'Necessary Roughness' was a football player in the woman's soccer which helps a lot. She also was an instant success in the film as a kicker showing she can stand up in the vital moments. Due to this, Draper makes the team. Centre Backs or Central Defenders are the heart of your defence. They are the last line before the goalkeeper and also have the task of dealing with the oppositions top striker. Now no opposition is ever the same and you may face different types of players. For this, to cover most bases, a big, tall, strong and quick. This allows them to deal with all sorts of players and in reality, are the perfect requirements for a player in this position. Now in movies, and in particular this is quite a common theme for characters in American Football movies. One who comes straight to my mind comes from 2005's 'The Longest Yard'. Described as a 'Coke machine with legs' is Switowski and giving his stature and standing over 6 ft 5 inches, he fits the description. Fast and powerful, it only makes sense for him to slot in at the centre of defence. Now at times, it may better to have a more technical player at the back. A calm head who can play the game very well and could potentially play further forward. However, they still possess great defensive prowess which of course is vital. One name springs to mind when thinking about those two particular traits and he doesn't necessarily come from a complete sports movie. 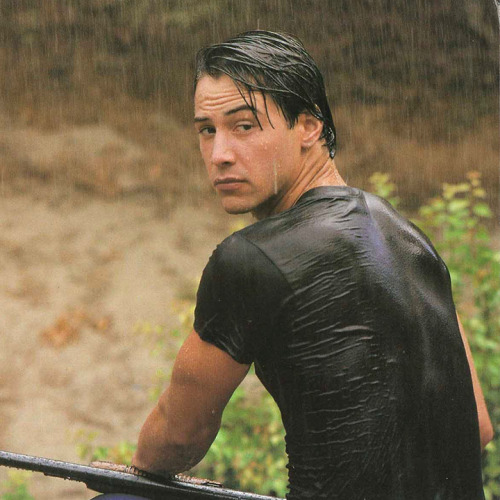 Johnny Utah is an FBI agent who was also starting quarterback for the Ohio State Buckeyes from the movie 'Point Break'. A leader as well as being talented, Utah shows in one scene his capabilities both going forward and defending with a great tackle on Patrick Swayze's 'Bodhi' into the sea. Utah is also good working in a team and a likeable character which is shown throughout the action movie. Not only does this make Utah a perfect fit for the team, but also the captain. Possibly the toughest position in football is in the centre of midfield. They are the core of the team, providing help for both the defence and the attack. The box-to-box midfielder is less apparent in football today but some characters in film may be able to fill this void. To play this position, stamina is quite important so that may be a good place to start. For this you may look at films that are based on runners and in particular those in marathons. One who stands out for me is Simon Pegg's character in 'Run Fatboy Run' Dennis Doyle certainly turned himself around from being completely lazy to a driven, determined and fit father. An injury doesn't stand in his way which shows how willing he is. However, his injury prone status as well as not being a stranger to being late, Doyle isn't one who you can rely on to play at full potential for the whole 90 minutes. A very bizarre option who carry high stamina is possibly the most unreliable. If you have seen movies such as 'World War Z' or '28 Weeks Later', you will know that the zombies possess superhuman lungs and are capable of running full pelt for long periods of time. However we all know the downside to being close to the walking dead. There is one player that does hold the abilities previously described very well. He can run all day, he can go forward and he sure as hell can tackle. From 'The Waterboy' Bobby Boucher proved to be a reliable player who eventually was vital going forward as well as naturally defending. He was vital in the Mud Dogs first ever championship win and although he has some severe anger issues, this is sometimes needed in the middle of the park. He can also do double duty as being the official waterboy for the team! In football, it is normal to have a player alongside the workhorse who is the more skillful and creative player. One who can play the ball into dangerous positions and cause havoc to the opposition team. A player who is sort of the play maker and that translates almost perfectly into American Football in the position of the quarterback. There are in fact two actors already on the list who could potentially fill this role. 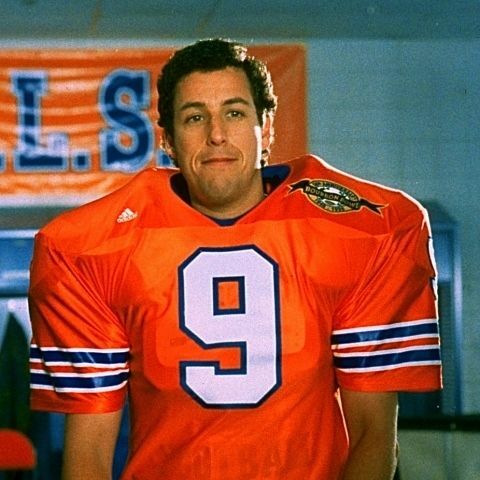 Keanu Reeves' character Shane Falco from 'The Replacements' and Adam Sandler's Paul 'Wrecking' Crewe from 'The Longest Yard' could both easily slot in as the main man in the middle. But for the sake of giving others a chance, I will leave them to the side. In this position, you want a player to play with confidence and as players play more and more, that confidence grows. This was also the case for Willie Beamen in 'Any Given Sunday' as he went from the bench to championship winning quarterback. Although his ego may get in the way, you need a player with that bit of flair who excites the crowd. For those reasons, Beamen joins Boucher in the midfield. Wingers as simple as it sounds play on the wings or if you don't know about football, they play wide in the pitch, close to the touchline. Typical traits that you look for in a winger are those who will run at the opposing team with great pace. Rapper Nelly plays Megget in 'The Longest Yard' who does so incredibly well throughout the guards game. Another player who is most certainly a speed merchant is Luis Mendonza from 'The Mighty Ducks 2 &3'. Unfortunately for these two, characters have already been chosen from their movies and this selection has to have some sort of control within it. A character that may not be a bad shout is the one and only, Forrest Gump. Tom Hanks' character with the tagline 'Run Forrest Run' is one of the most memorable quotes in film history would potentially be a good fit. His speed would cause all sorts of problems along with his determination. Gump is a welcome addition to the team. Wingers are also known to be quite flashy at times and also very skillful. With sheer pace on one wing, having a tricky player on the other side would be another great outlet out wide. In sports movies, there have been many players who like to tease the opponent with their skill and entertain the fans. One of them comes from Will Ferrell basketball movie 'Semi Pro' in the form of the character Clarence. A player who likes to show off with his entrance to the court and style of play. Another who could be considered flashy is the legendary Apollo Creed from the 'Rocky' franchise who again, like Clarence is an entertainer. However, the pair of them are more flashy in there antics away from the game or in the build up and not nearly as much in their actual game. My choice comes from the Ice Hockey movie 'Goon' and is the highly skillful Xavier Laflamme. Laflamme has a very slow start at the beginning of the film due to many problems but in the finale and after regaining his confidence, he soon became a prolific player leading and carrying his team to glory. He is proven to show up when needed and is worth a place in the team. The forwards are the men furthest up the pitch at all times. These are the players you want closest to the goal as they are most likely to score. These players get most of the credit and the glory and are the players who are most looked up to as heroes. For these positions, it wasn't exactly that hard for me to choose. The first player comes from the most successful football (soccer) franchise 'Goal!' and is of course the main character Santiago Munez. The Mexican is extremely talented with an eye for goal which in the end landed him a (fictional) move to Spanish giants Real Madrid. Achievements like that can't go unnoticed when creating this team as he slots in perfectly. If you go to some of the most remote places in the world and were to ask about the beautiful game, there are very few players that the world as a whole would know. Luckily for me, one of them appeared in film back in 1981. 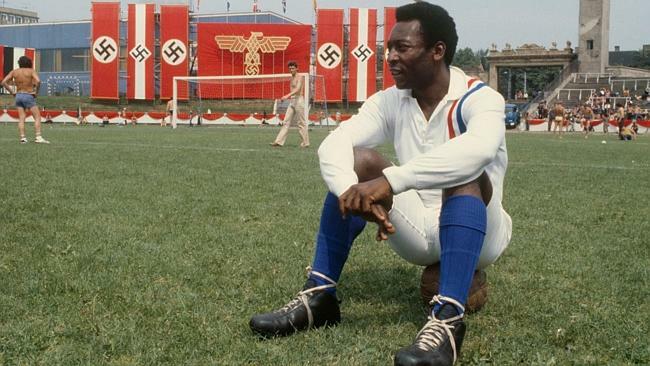 'Escape to Victory' features the one and only legendary Brazilian Pele or Corporal Luis Fernandez as he is known in the movie. He scores a phenomenal overhead kick in the movie and was capable of much more in real life. It's the most obvious decision in the entire team and he would make any team a lot better. No team is complete without a great manager. Now there are many that I could go with. 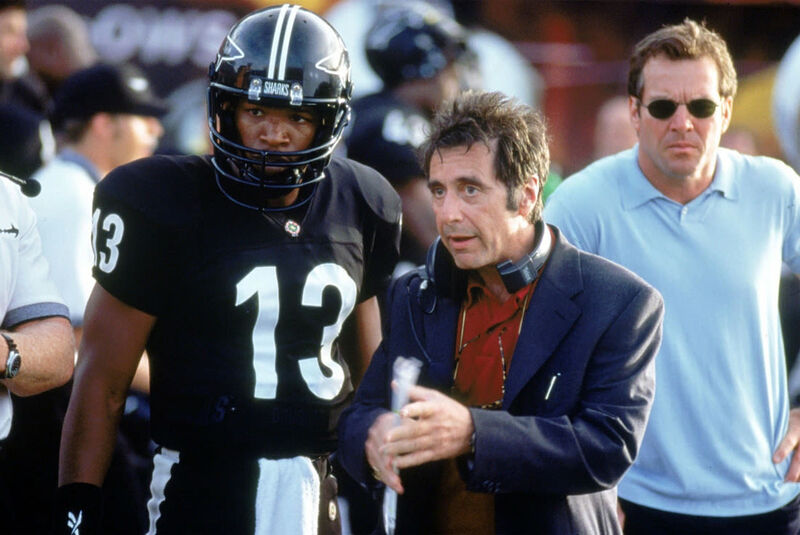 I could take Al Pacino's Tony D'Amato from 'Any Given Sunday' or Samuel L Jackson's Ken Carter in 'Coach Carter'. I'm spoiled for choice for a manager but there is one who stands out. In the film 'Remember The Titans' Denzel Washington as Coach Herman Boone brings two teams with many differences together and gets the best out of them. He was able to take people who didn't remotely like each other and did a fantastic job with them. The players I have picked may not necessarily see eye to eye but Coach Boone would be more than capable of getting them to work together. So that concludes my team, what do you think of it? Apart from reviews, this was one of the most fun blog posts I have wrote and gave me a chance to dive into another topic I'm interested in. I hope that this was fun and enjoyable for you to read and would like to know which movie characters would make your sports teams. Once again thank you for reading my blog, it is much appreciated!